Mark graduated from Boise State University with an undergraduate degree in criminal justice in 2008 and from the University of Montana School of Law in 2013. He was admitted to State Bar of Montana and joined the firm in 2014. 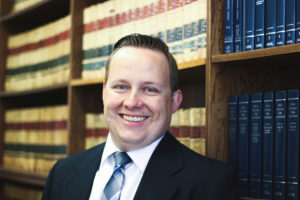 He is licensed to practice in Montana state and federal courts and in Idaho. Mark’s practice emphasizes general litigation. Mark was born and raised in Idaho. After graduating high school and before college Mark spent time in South America teaching and volunteering with a service organization. Upon returning home he relocated to Montana to attend law school based on the excellent recommendation of some wise friends. He and his wife fell in love and are blessed to now call Montana their home. In his personal time Mark enjoys spending time with his wife and three children, travelling, camping and getting lost in a good book.